Pope Francis makes a private visit to a community of cloistered Poor Clare nuns Jan. 11. The Vatican press office said he visited the monastery of Santa Maria di Vallegloria in Spello, about 100 miles north of Rome, to encourage the sisters and to share prayer, the Eucharist and a meal with them. Also pictured is Bishop Gualtiero Sigismondi of Foligno, Italy. (CNS photo/Holy See Press Office). VATICAN CITY (CNS) — Pope Francis left the Vatican Jan. 11 to visit a community of cloistered Poor Clare nuns in Umbria, the Vatican said. In some ways, Pope Francis was repaying a visit. 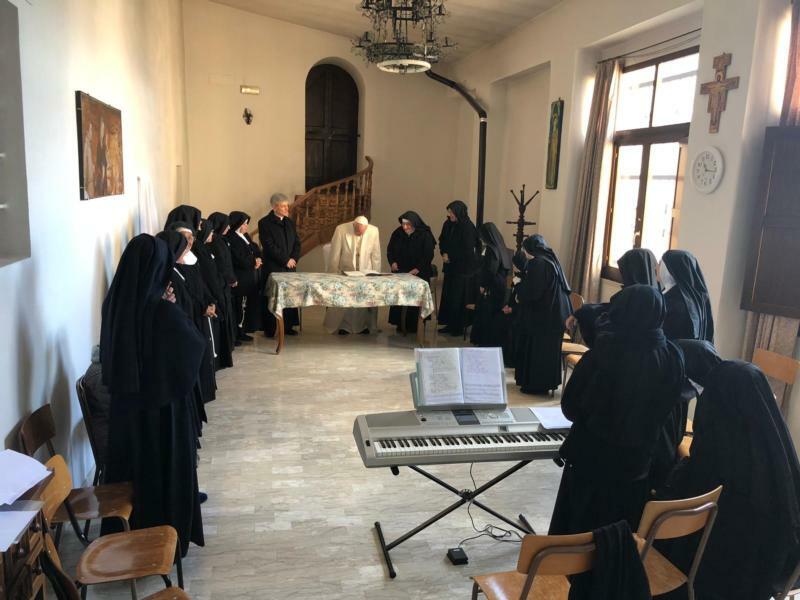 Members of the Poor Clares of Santa Maria di Vallegloria in Spello, about 100 miles north of Rome, had visited Pope Francis in August 2016 at his Vatican residence, the Domus Sanctae Marthae. During the 2016 meeting, the pope personally gave the Poor Clares — and symbolically all contemplative women religious — in his document “Vultum Dei Quaerere” (Seeking the Face of God), which updated rules governing contemplative communities of women.